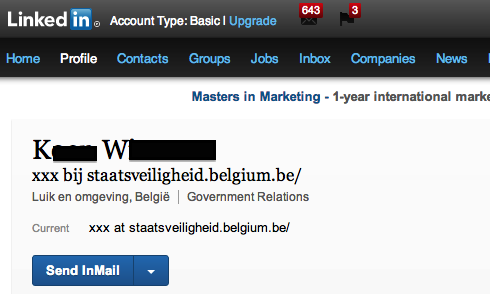 You’d never catch James Bond or Jason Bourne doing this, I’m sure: dimwits working for Belgium’s State Security Service are reportedly sharing the name of their employer on social networking sites. A report in local newspaper De Standaard says Belgian State Security officials and politicians charged with overseeing the civilian intelligence agency have already expressed concerns over the LinkedIn and Facebook profiles of certain employees. It appears that a simple search reveals that some State Security workers are publicly sharing the name of their employer, which obviously poses security risks. It’s worth noting that State Security officials wouldn’t confirm that these profiles are genuine, which means at least some of them have half a brain. It’d sure be funny if they confirmed they are in fact real profiles. Someone high up in the Belgian intelligence agency told De Standaard that ‘Russian and Chinese security services employ thousands of people, enabling them to do searches for this kind of information on social networks and exploiting it’. He or she added that the simpletons oversharing such information on LinkedIn and Facebook are setting themselves up as ‘targets for hostilities’. Not to mention FarmVille requests and pokes, I might add.